We’ve really been digging on Maoam lately. From their Sour Stripes, to their Bloxx, Pinballs, ….they’re doing good stuff. Centering mainly on chewy treats, we got a weird one in the mail from Germany recently. As sad it is, I can’t tell you how excited I was to try these. Even took them to Mexico on holiday, but then brought them back before opening them as I realized I couldn’t get good photos of them in the sand. Not just rocks mind you, these are Roxx. And purportedly, they’re also crazy. Coming in with 5 relatively standard flavors (orange, strawberry, lemon, blue raspberry and apple), these were poised for a breakout party. And then I tried one. First…despite popular opinion, these just aren’t crazy. To be crazy, I’m expecting a super sour powdered inside, or a crunchy center, or perhaps it’s a thin shell, holding several other smaller roxx inside. Something. 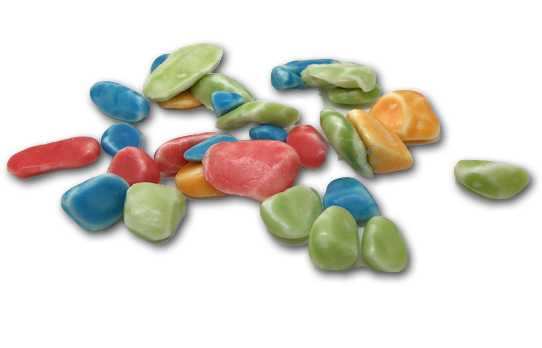 But no, these are just taffy chews in standard flavors in rock like shapes. They’re not deliciously sour like the Sour Stripes-but they resemble with an almost uncanny accuracy the regular Maoam Stripes. 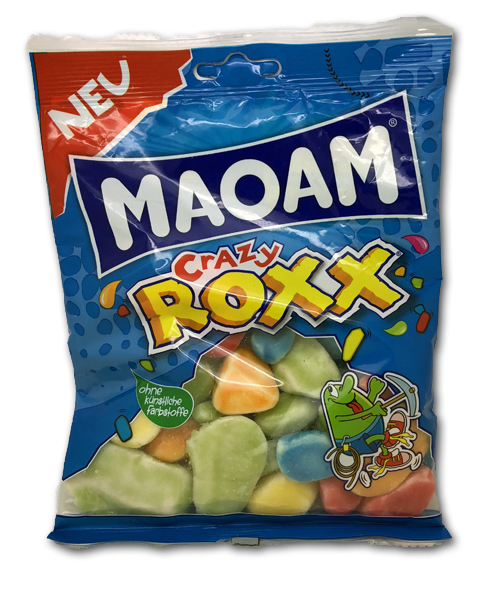 So we had Sour Stripes which turned out to be exactly the same candy as Sour Bloxx, but in different sized shapes. There’s also regular Stripes, which turn out to be more or less the same thing as Crazy Roxx, but in different sized shapes. We’re on to you, Maoam. You duplicate a candy, then give the “new” iteration a whimsical name that ends with two X’s. We’re on to you….but we still love you. These though? Disappointing to me. Jonny Guru Jr. loves them, but he’s not nearly as hardened and jaded as me. I’m looking for new, for different, for weird, or for excellent. These don’t fall into any of those categories for me, but that doesn’t mean they’re bad. Just bad for a Guru.